Below is information that was on the original Fernald Medical Monitoring Program website, during the years when the medical surveillance program was clinically active (1990 – 2008). Physical examinations are no longer being provided by the Fernald Medical Monitoring Program. Teresa Ramirez (right) draws Edwa Yocum’s blood as part of the Fernald Medical Monitoring Program. The Fernald Medical Monitoring Program (FMMP) is an entirely voluntary medical screening program. Participants are free to participate in any part or all of the medical re-examination program and yearly questionnaires. The components of the re-examination are outlined in this section. 1.Maintain ongoing contact with participants. 2.Monitor and document the significant previously identified health problems. 3.Monitor and document changes in health status among participants at regular intervals. 4.Provide health screening and health promotion services to participants regular intervals. The first step is to understand and sign the consent for the physical examination and testing. Participants are sent a copy of the consent to review before their examination. Participants may indicate any part of the examination or testing that they do not wish to have done. No examination or tests can be performed until consent is given. Participants will be asked to sign the consent when they arrive. Participants are asked to complete a health questionnaire yearly. If they indicate that significant changes have occurred in their health status (during the interval since the last questionnaire or examination), we request a “release of information” from them in order to obtain vital medical information for their records. For instance, if a participant had a new diagnosis since the last examination, we request copies of the hospital discharge summary, pathology reports, and surgical reports. In this way we can update their record. If a participant does not wish to have an examination and testing, we still ask them to complete the questionnaire. Participants will be offered a screening health examination every two years during the anniversary month of their initial examination. The nursing staff measure weight, height, blood pressure, and pulse rate. The physician asks questions about their health problems and symptoms and performs a focused physical examination of their skin, thyroid gland, lymph nodes, mouth, heart, chest, and abdomen, Adult women are offered a breast examination and a pelvic examination and Pap smear. Adult men and women over 45, years of age are offered a rectal exam. Adult men are offered a testicular exam and men over 45 years of age are offered a prostate exam. Vision and hearing testing is also offered. Screening laboratory tests are performed which include red and white blood cell counts, blood salts, kidney function, blood sugar, and cholesterol. Men 50 years of age and older are offered the Prostate Specific Antigen (PSA) test, a screening test for prostate cancer. Urine tests for sugar, protein, and blood are offered to all adults 45years of age and older. All participants with known diabetes are offered a hemoglobin A1c test which measures how well their blood sugar has been controlled. A small amount of the blood drawn may be frozen for possible additional testing in the future. Participants are asked to fast for 10 hours before their blood tests. Participants should take their blood pressure medication with a small amount of water before they come. Participants are advised to bring other medications with them to take after their blood has been drawn. Food is provided after the blood draw. Chest x-rays are offered to all adults 40 years of age and older and adults under 40 years of age who smoke. EKG (electrocardiogram) heart tracings are offered to all adults 40 years of age and older. Mammograms will be offered each year to women 40 years of age and older. All adults 45 years and older will be offered testing of stool for invisible blood (hemoccultR). Additional follow-up testing may be offered to participants in selected circumstances when the results of screening tests are ambiguous (e.g. mammography). After the medical examination participants receive a letter from the FMMP examining physician summarizing his or her findings and recommendations for follow-up. Letters are sent by first-class mail about 4-5 weeks after their examination. With the letter, participants will receive copies of the laboratory test results and an explanation of the lab tests that were done. If the participant authorizes us to do so, a copy of their letter and results will be mailed to their physician. One of our staff may contact the participant by phone following their examination to notify them of abnormal test results of concern. These results can be faxed to their physician if the participant authorizes us to do so. Participants may call the office at 874-1074 to find out their blood and urine test results. We will have these results about 48 hours after testing. We will not have the chest x-ray or mammography results for about two weeks. A satisfaction questionnaire postcard is enclosed with their examination and testing results. We ask participants to fill out the satisfaction questionnaire postcard and return it: in this way, we will know the participant has received their results and can let us know how we are doing. Each returned postcard is reviewed and appropriate follow-up is done if needed. The participant will be called if more information is needed. If you are scheduling your mammogram through FMMP and you have had a mammogram in the recent past at another location, it is important to obtain those films for comparison. We will send you a release to obtain these films. You will need to sign the consent and return to us ASAP. A delay in getting your outside films for comparison will delay the mammogram report. You will receive your mammogram results by mail in about 3-4 weeks. If the radiologist requests you to have more films taken to complete your mammogram, we will notify you by phone. The additional views &/or ultrasound will be completed as a diagnostic mammogram at University Pointe Imaging. If you do not schedule your mammogram through the FMMP, it is still important that you contact us so that we may send your old films for comparisons. Please call our office at 513-874-1074 or fax a signed release to 513-874-5480. The radiologist will review your films while you are there and may request additional films or an ultrasound to complete your diagnostic mammogram. You will know the results of your mammogram before you leave. Screening mammograms, diagnostic mammograms, and ultrasounds are covered by the Fernald Medical Monitoring Program. If a biopsy is recommended by the radiologist, you will need to contact your Primary Care Physician and your insurance company. The FMMP does not cover this procedure. We strive to maintain strict confidentiality and security of the information we collect. Code numbers (rather than names) are stamped on all forms when feasible. All paper records are kept in an office building that is separate from the building where the medical examinations are conducted. Medical charts and radiographic films (x-rays) are kept at this site, protected by a security system. For most diagnostic tests, participants are identified only by the ID number and not their name. Information about the examinations or from the questionnaire is not given to any party other than the participant or their physician, and only if the participant signs a form requesting that results be sent to the physician. We never provide information to insurance companies, and do not fill out school physical forms or other similar forms. However, at any time, they may have a copy of anything in their medical record. The test data, questionnaire responses and examination findings are entered into a computer database, but only your identification number is used for confidentiality. The link between your identification number and name is kept in a separate, secure portion of the database. The computer system is housed entirely in the medical records area, and is not connected or networked to any computers outside that area. The entire computer system is password protected. No one outside of the Fernald Medical Monitoring Program (FMMP) will have access to the information that is collected except as authorized by the Fernald Settlement Fund Trustees. If other scientists’ wish to use the information for research, they must apply for access to the data by completing a written application, which is then reviewed by the Citizen’s Advisory Committee, Dr. Wones, and the Fernald Trustees. If all approve, the data is provided without identifiers (name, address, phone number) other than the identification number. If authorized by the Fernald Settlement Fund Trustees, scientific data or medical information may be analyzed and presented in court, at scientific meetings, or in professional journals so that the over all results of this Program may be useful to others. However, presentation of results will not include names or other identifying information which might compromise the right to privacy. Every reasonable effort shall be made to ensure anonymity. Q. Can I participate in the Fernald Residents’ Medical Monitoring Program? A. In order to participate in the Residents’ Medical Monitoring Program, you must have lived or worked within five miles from the Fernald uranium processing plant for two consecutive years between 1952 and 1984. Workers at the plant are not eligible for the Resident Medical Monitoring Program. An application must be completed and returned to the Fernald Settlement Fund Office for review. You will be notified if you are eligible to participate and at that time you may schedule your physical examination. Q. How often do I receive an examination through the Fernald Medical Monitoring Program? A. Physical examinations are offered every two years on the anniversary of your first examination with the Fernald Medical Monitoring Program. We are currently in the 2003/2004 examination cycle. Participants will be offered one examination during this cycle. Q. Will the Fernald Medical Monitoring Program pay for my breast biopsy, any treatment, etc.? A. Each examination includes many medical screening tests, but the Medical Monitoring Program does not provide additional diagnostic testing for abnormalities discovered on screening tests. The Program is not permitted to provide treatment for diseases or conditions identified. All Participants will be referred to their physicians for further diagnosis and treatment if necessary. Q. Are the exposures from the Fernald plant responsible for my illness? A. With the scientific information currently available, in almost all instances it is not possible to establish whether or not an individual case of disease is caused by living close to the Fernald plant. For example, the characteristics of the tumors of persons with lung cancer who have had substantial radon (radioactive gas) exposure are not different from the tumors of those without that exposure. Epidemiologic studies, however, can determine if an increase in the rate of disease in a population is related to an environmental exposure such as the radioactive or uranium metal exposure from the Fernald plant. Q. If I need my mammogram or chest x-ray films, where do I call? A. All radiographic films that are taken through the Fernald Medical Monitoring Program are stored in the administrative office at 6120 S. Gilmore Rd., Fairfield, Ohio 45014. You may sign your films out by calling 513-874-1074. Q. When will I receive my letter and test results after my physical examination? A. Your letter and test results from your physical examinations will be sent to you and your designated physician about 4-5 weeks after your examination. Your blood test results are available about 48 hours after your examination. Mammogram and chest x-ray results will be available in about two weeks. The Fernald Medical Monitoring staff will notify you of any tests that are of concern. You may contact the office at 513-874-1074 to receive your results and with your permission we will send or fax results to your health care providers. Dr. Robert G. Wones is the Project and Medical Director for the Fernald Medical Monitoring Program (FMMP). He is a Professor of Medicine at the University of Cincinnati College of Medicine and is certified by the American Board of Internal Medicine. Dr. Wones has directed the FMMP since 1990 when he developed the initial design of the Program. His responsibilities include monitoring the continued progress of the program, planning for future program needs, research development, and reporting to the supervising federal judge and trustees. Jenny Buckholz RN, MSN is the Program Coordinator for the Fernald Medical Monitoring Program. She has been with the Program since February, 1999. Ms. Buckholz has over 33 years of diverse clinical, educational, and managerial experience in emergency, ambulatory, inpatient, and trauma care. She has her Masters in Community Health Nursing. Her responsibilities include overseeing the operations of the Fernald Medical Monitoring Program. She coordinates services to provide quality care to participants in the Program and follows up on any issues that do not meet the Program’s standards. Ms. Buckholz works with Dr. Robert Wones and Dr. Susan Pinney in planning and implementing activities to meet the Program goals. Dr. Susan Pinney is an epidemiologist who works closely with the staff of the Fernald Medical Monitoring Program. Her Primary responsibility is to ensure that all of the information collected about program participants is accurate and in the format necessary to conduct research. To accomplish that aim, Dr. Pinney writes questionnaire items, reviews the design of data collection forms, collaborates on the design of the computer database, and performs quality assurance on the data collected by the program. As an Associate Professor in the Department of Environmental Health at the UC College of Medicine, Dr. Pinney conducts research studies on the health effects of environmental exposures to human populations, including studies of Fernald community residents and Fernald workers. The administrative office for the Fernald Medical Monitoring Program is located in the Fairfield Executive Building at 6120 S. Gilmore Rd., Suite 203, Fairfield, Ohio 45014. All records and radiology films done through the FMMP are maintained in the administrative office. The FMMP administrative staff includes medical secretaries, medical record coders, and data entry personnel who have expertise in the management of records keeping. The administrative staff supports the clinical area with the records and films needed for the FMMP examinations and testing. Responsibilities of the administrative staff are to review, code, computer enter, and file all FMMP records and films. This process forms the basis for subsequent epidemiological studies envisioned in the Fernald Settlement. The clinical office for the Fernald Medical Monitoring Program is located in the Medical Arts Building at 2960 Mack Rd., Suite 211, Fairfield, Ohio 45014. The physical examinations for the FMMP are done at this location. 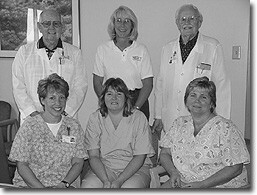 The FMMP clinical staff includes registered nurses, medical assistants, transporters, and clerical staff. Responsibilities of the staff include scheduling appointments for FMMP physical examinations, screening mammograms and chest x-rays at Mercy Hospital; assisting participants during the physical examination and testing; and escorting participants to radiology services in the hospital. The clinical staff will obtain updated information on the health status of Program participants. As the Program becomes aware of changes in the health status of a participant, the clinical staff may request permission to obtain appropriate medical records (such as biopsy reports, hospital discharge summaries, or reports of CT scans) by having the participant sign a “release of information” consent. This information will form the basis for subsequent epidemiological studies envisioned in the Fernald Settlement. Trudy MacDonald RN, MSN has 32 years of experience in emergency, critical care and clinic nursing. She joined the Fernald Medical Monitoring Program in September 1999. Her primary responsibilities are reviewing laboratory and physical examination findings that are included in the letter from the FMMP physician. Trudy will follow up with participants for any test results of concern and with the participant’s permission will send the results to their primary care physician. An important part of Trudy’s responsibilities is to answer participants’ questions regarding the Program, reported findings and recommendations in the examining physician’s letter. She may also notify participants regarding the need to follow up on chest x-ray and mammogram reports of concern. Trudy also works with Dr. Susan Pinney in reviewing data for research studies on environmental exposures in the Fernald community residents. Brenda Brastauskas, RN, MBA has 20 years of experience in critical care and public health nursing. She joined the Fernald Medical Monitoring Program in January 1998. Her responsibilities are reviewing physical examination and laboratory findings. These results are included in the letter from the FMMP physician. Brenda will also follow up with participants for lab and/or urine test results of concern. With permission of the participant, Brenda will send results to their Primary Care Physician. Sandy Sahnd RN, MS has over 38 years of experience in emergency, inpatient, and ambulatory nursing. She joined the Fernald Medical Monitoring Program in 1991. Sandy is responsible for the participant follow-up and quality review part of the Program. She works with Maureen Bosken RN and Dee Chavez RN, BSN in contacting participants by phone to follow up on any concerns that were identified during the FMMP physical examination, lab or radiology testing, or reported by the participant on their annual questionnaire. Sandy’s follow up also includes participant notification of chest x-ray and mammogram results that may need further evaluation. Because it is important to have updated information on the health status of program participants, as the program becomes aware of changes in the health status of a participant, Sandy may request permission to obtain appropriate medical records (such as biopsy reports, hospital discharge summaries, or reports of CT scans). With the participants’ permission, the program will send a “Release of Information” consent to be signed and returned. The information will form the basis for subsequent epidemiological studies envisioned in the Fernald Settlement.